Click here to get the RSS Feed! How many times have we all thought about a decision we made that could have gone differently? 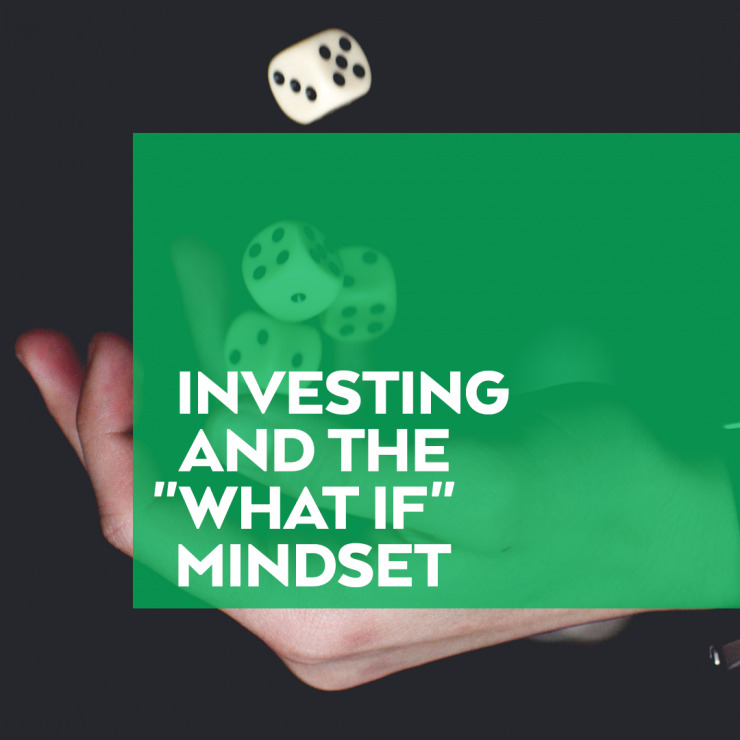 The infamous, “What if?” We’ve all been in the position for various personal matters in our life, and in investing, I’ve experienced many instances where people apply the “What if” mindset to their investing approach. As a financial advisor, I don’t let the uncertainty of the future or thoughts of grandeur affect my decision-making process when it comes to investing and I’m here to encourage you not to either. For some, not all, the thought of investing breeds ideas of getting rich quick. People may view it as a quick means to an end to invest a small amount in a few select stocks and boom, you’re 10 times more well off than you were a few weeks ago. If you’ve attended our investing seminars or have read any of our blogs on the topic of investing, you know this isn’t our idea of investing. This is speculating; trying to pick stocks that you think will do well in hopes of gaining a massive return. It’s risky, just like gambling. I too love the thought of hitting the lottery or finding the perfect stock that takes off and helps me retire early. It’s a dream scenario, but it’s an unlikely dream and I am sorry to welcome you to the nightmare of reality. Just kidding, but that’s the power of the “What if” thinking. You may think, sure passive investing is safe, but what if I can just choose the right stock I can *insert dream scenario here*. I get it, everyone wants to be more well off than they were the day before and I don’t blame you for dreaming big or even looking at investing for the way to do it. Heck, I’m glad you’re even thinking about investing, but as a financial advisor it’s my duty to let you know the right way to invest, and that’s a point I will address in a moment. So why are we in this mindset and taking risks? It’s very rare to actually find a company in the small cap/initial growth stages and ACTUALLY have it grow 100x its value. It’s truly a gamble. The statistical probability is so low that you are better off playing craps at the casino (closest to 50% odds of winning). You’d probably think I was crazy for suggesting you gamble your savings, so why are you going to play the “what if” game with investing and risk having a setback with your retirement money or other goals you have been saving toward? On the other end of the spectrum, there are the “what if” people who rather not invest because they are scared of potential risks. The type of people who might say “Yeah the market is high now, but what if the market crashes?” I love when people bring this up and also cite whichever expert is predicting it to crash. People have been predicting the market to crash for over half a decade now. I will say this, though; someone will eventually be right. That being said, however, if you have invested and aligned your portfolio with your goals, it shouldn’t matter if the market crashes. If the market crashes, and you are aligned appropriately, your financial advisor could help you take advantage of that. If you are unable to do so, you may need to reassess your strategy and allocation. You shouldn’t have an aggressive portfolio for something you want to use within the next few years, that’s due to the fact that we prepare as if there could be a market crash. The “yeah, but what ifs” are already built into the management style and expectations. If you have met with me at InvestEd or in any of my previous advisor roles, I have probably frustrated the hell out of you with my reason over emotion style of advising. I tell you the truth, not what you want to hear. Is it possible to find a stock that explodes in growth and you are sitting pretty after a small investment? Sure! People love to contemplate how far along they’d be if they’d taken a hot tip and gotten on the ground floor of a small company with great potential. The classic “What if I had invested in Apple back in the 90s?” or “What if I had been roommates with Kevin Plank and gotten in on Under Armour?”. What if you had taken the risk at the time? The money you would have possibly put up could have been the difference of possibly making it “rich” and you paying your rent that month. What if you had invested in that “hot stock” and it went the opposite way and you couldn’t afford rent? I just want to let you know, whatever the reason was at the time, whatever compelled you NOT to do it, you probably made the right decision. To get to the finish line of your financial dreams/goals, it’s all about taking calculated risk and growing the right way. Additionally, to help you avoid getting into a “what if” sunken place, you should talk with a registered advisor about your goals (and you can still dream big here) so that they can see how feasible they are to achieve based on your current situation and manage your investments to get as close to your goal as possible. I have been in the industry for over 7 years, so it is easy for me to be objective and keep my eye on the end goal for my clients. For that reason, I see value in having someone else manage my money. It takes a lot of question marks and variables out of the equation which is important when I am trying to stick to my own personal goals and avoid letting “what ifs” regulate my investment strategy. Now, believe me, I’ll be the first person to tell you doing things the right way can be annoying, less fun, less exhilarating, and time-consuming, but the great thing about this approach is achieving what you set out to without the worry of things potentially going wrong. I can attest that this slow and steady approach works. I have worked with many clients over the years that were millionaires, and the vast majority of them did not accumulate their wealth by taking excessive risk. Once they were retired, they wanted to STAY retired, so throughout their years of investing, they stayed disciplined, they contributed to their retirement plans methodically and hired professionals to make sure their money was managed appropriately. It’s simple and it can be as simple as you want to make it too. At InvestEd, you have the ability and the access to start investing now. We bring wealth management style services to clients of any size. You don’t have to play the “what if…” game; you can come here where I will help you manage expectations and stay on track. A few weekends ago I bought myself a Fitbit because recently I have been slacking in my physical health. I began to think, if I truly believe in staying around with my clients for decades to come, then I wanted to personally hold myself accountable to do everything I can to stick around here. I bring this up to show the power in disciplined behavior and how it can help you achieve what matters to you most. So, I am asking you to do the same thing when it comes to your investments. Be disciplined, methodical, realistic and persistent in investing for your goals. If you need help talking the first step, I am here to help out, even if you don’t want to utilize our management services thereafter. InvestEd welcomes any and every one to schedule a complimentary financial planning meeting anytime. I personally promise to make myself available even at odd hours of the night, if need be, to meet with people who are ready and willing to talk about their finances and need help. It’s important to me, and I hope it’s important to you. I hope to see you soon. Every month, InvestEd posts current information about financial events happening throughout the world, or just interesting things to know about your money. Read about them here. PTC International Portfolio Management, Inc. d/b/a InvestEd. is a registered investment adviser offering advisory services in the State of Maryland and in other jurisdictions where exempted. Registration does not imply a certain level of skill or training. The presence of this website on the Internet shall not be directly or indirectly interpreted as a solicitation of investment advisory services to persons of another jurisdiction unless otherwise permitted by statute. Follow-up or individualized responses to consumers in a particular state by InvestEd. in the rendering of personalized investment advice for compensation shall not be made without our first complying with jurisdiction requirements or pursuant an applicable state exemption.